First up, I was featured as the most clicked blog over at A Pocket Full of Polka Dots! I like bright accessories (especially handbags) as they make me smile when I wear them. As the boys and I have been a little unwell lately, I've been enjoying wearing one of my brightest bags - my magenta Balenciaga day bag - when we've been well enough to get out the house. Blue is my favourite colour and also gives me a bit of a boost when I wear it. While the pink bag pops against a black or grey outfit, I love the colour combination of blue and pink too. This was a nice easy outfit. I've shared the simple winter trick of throwing a knit over a breastfeeding singlet to look a little more pulled together before. Went to the park and had a doctor's appointment. It was quite a sunny day so I didn't wear a scarf with this and even considered taking the jumper off a few times! I really like the magenta bag and cobalt jumper together. Last worn: Ray-Ban Wayfarer, cobalt knit, skinny jeans, Converse, Balenciaga magenta day, Marc Jacobs Eliz-a-baby bag. Other ways to wear: cobalt knit in the office, skinny jeans and a trench coat, Converse and flared jeans, Balenciaga magenta day with a neutral outfit. Such a busy morning when I wore this. Knowing that there seemed to be a cycle of feeling better and then quickly getting sick again, I tried to cram as many errands into one morning as I could when we seemed to be feeling okay. I was running behind and then an extra long stop at the post office (because I was chatting too long) and my local store being sold out of something I wanted meant I didn't manage to get everything done. I made a good attempt though! I'd thought of wearing the tee and skirt together back when I first bought them, and as I liked the cobalt and magenta in the outfit above I thought the cobalt scarf would be a nice addition. While I like the colours together and I like each piece separately, I was a little unimpressed with how it all looked. As I was running late I just wore it anyway, but probably would have changed if I'd had more time. Not quite an outfit fail, more a case of something not looking as nice on as I'd imagined in my head. 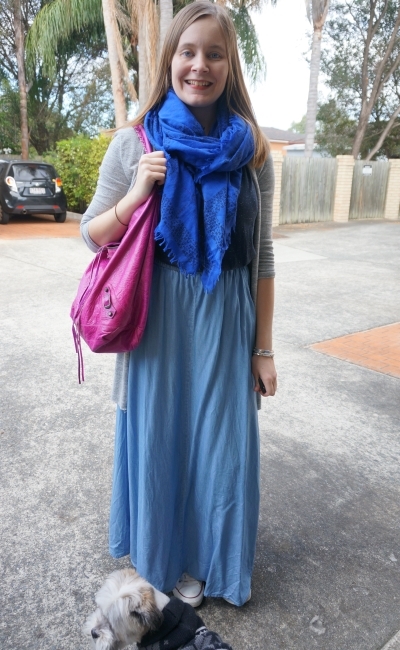 Last worn: cobalt scarf, grey cardigan, navy marle tee, chambray maxi skirt, Converse, Balenciaga day bag (above). Other ways to wear: cobalt scarf and stripes, grey cardigan and flare jeans, navy marle tee and a leather jacket, chambray maxi skirt and purple, Converse and grey jeans, Balenciaga magenta day with graphic tees and a baby bump. Linking up with Fab Faves, The Ultimate Rabbit Hole, Shoe and Tell, Let It Shine, Hello Monday, Modest Monday, Classy Monday, Mix It Monday. Gorgeous outfits, you look great! I love the combination of blue and pink too - both outfits are lovely! I hope you and the boys are feeling better now! Love the blue and magenta. Hope you can all stay well! Mica you look great, specially that second look with that pretty bright pink bag and blue hues. I love that you paired such a high-end bag with your cons for a really wearable look! Magenta + Blue is my new favourite colour combo. Have a great weekend! Congrats on the most clicked! :) I love the pop of colors you always add to your outfits! You have an amazing aray of bags and scarves! I saw that on A Pocketful of Polka Dots, congrats!! These looks may be my favorites of yours yet Mica--something about the blue of your sweater in your first look and the scarf in the second look so, so pretty with that bag. I want to put those colors together right away!! So gorgeous! As usual. Love the pink and blue mixture. Sorry that you guys have not been feeling good! But I agree that a fun bag can definitely brighten up your day! The pink looks really nice against the blue! You look beautiful in blue, which is why I can totally understand why it's your favorite color! I love the way it looks paired with pink too and you've created such lovely pairings with the two. I hope you fully feel better! I wouldn't think of this color combo, but I really love it! It's unexpected, but in a good way! That colour of that magenta bag is just glorious and doesn't it go so great with that blue?! Two beautiful ways to style such a fun bag! I love that bag! And I love bright purses too! Especially for work, where we have a strict dress code, so bags are one of the only ways we can show personality. Blue really suits you, and the magenta is nice and bright. I turn to bright lipsticks when I don't feel the best, so I completely get your choice of bag. That’s such a nice way to inject some brightness into your day when your boys are sick! I hope they get well soon. Love the outfits. You always wear casual chic so well. love the blue and pink color combo! such a fun vibe! I like bright accessories too and my handbags are mostly colourful, I own only 2-3 black bags. I love your blue sweater, such a lovely colour! Blue is my favourite colour as well. That Balenciaga is so chic! I like the design. I love the idea of a colourful bag...it can brighten up an outfit! Love the colour! I think colour can make us feel better! Magenta is such a gorgeous colour! You are almost at 400 followers! You look great in blue! And the pretty bag looks so nice with the blue! really cute, love the pink bag! Thanks, we are much better. Oh very cute bag darling! Love that blue sweater on the first look! Goes so well with the bag! Yay on your most-clicked! Well deserved, I'm sure. Hope everyone gets well and stays that way soon. Surely warmer weather will help. Yes I'm hoping the warmer weather brings a break in the sickness! Blue just happens to be my favorite color too! (: Though the shade is more of a powdery blue. (; Dang you guys are STILL sick?! Does it seem like there's some relief coming soon? I sure hope so! Two cranky babes makes for a cranky mama. Congrats on being the most clicked blog! You totally deserve it! Thanks Kiki! It has been such a tough winter! We are better now, but I'm waiting for something else to hit....ha! Bummer the little ones haven't been feeling good. Hope they feel better this week! You look adorable though! Mica, both looked great! Love that pop of magenta with the blue & gray. Looks so pretty combined :D I bet everyday is an errand. You look spectacular my friend. I love that magenta color! Your second outfit is exceptionally cute! This bag is absolutely fabulous! Love the bright pop of colour. Hope you have a lovely week! That bag is so adorable and such a great pop of colour. I love colourful accessories too...a bag in a bright colour always brings a smile to my face. I also really like the combo of pink and blue. You look lovely in both these outfits.